9. 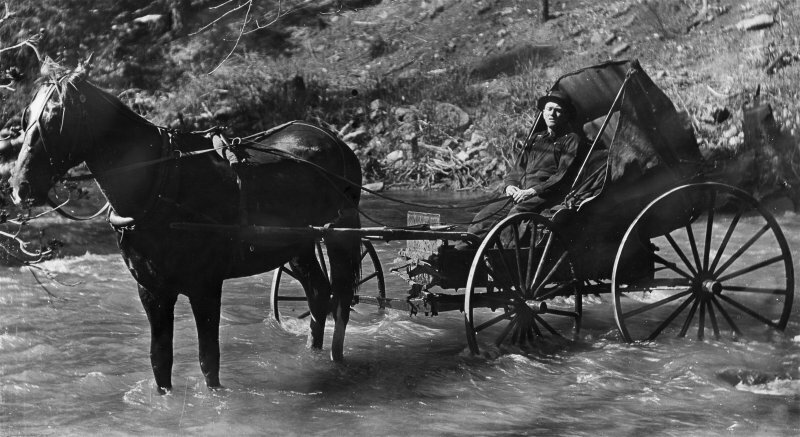 Democrat Carriage or Buggy - 1870s onward. 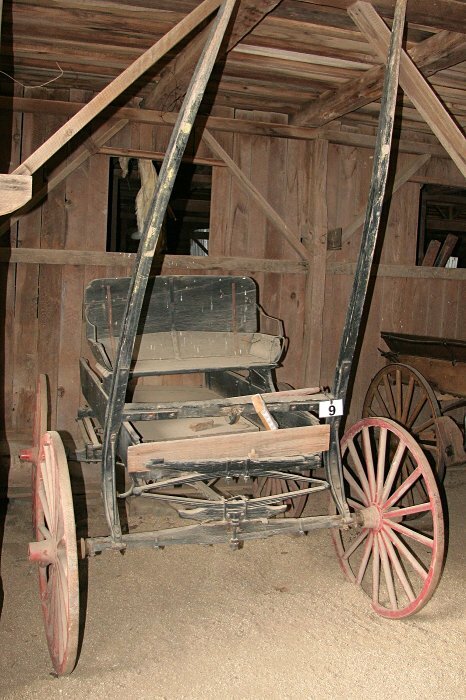 A very simple buggy which served as personal transportation. It was not affordable for many families before the 1890s but was popular with professional people for quick trips between towns. Small loads or luggage could be carried in the bed. Because it has no top or cover, in cold weather the driver and passengers used heavy lap robes and sometimes a metal foot warmer, filled with fire coals. 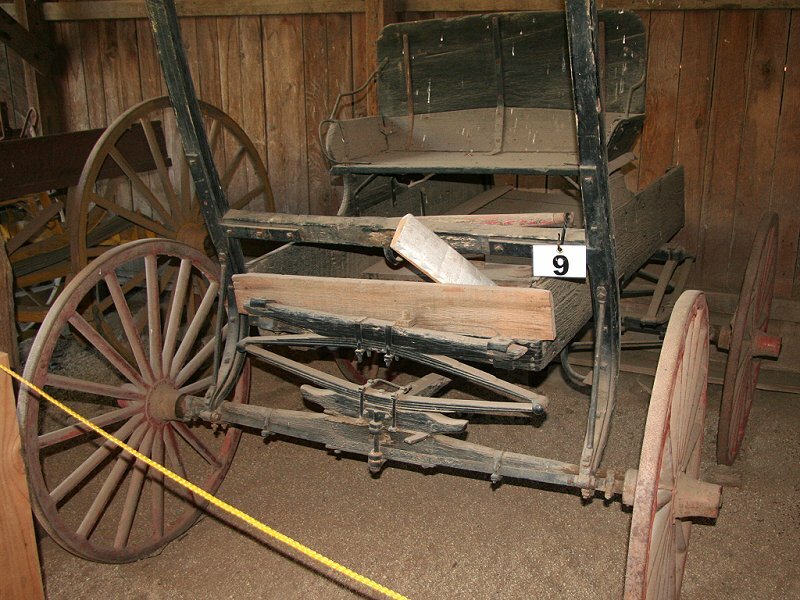 This wagon belonged to Joseph Wood, a teamster from the nearby town of Oregon House, and was donated to California State Parks by his daughter upon his death in 1965. 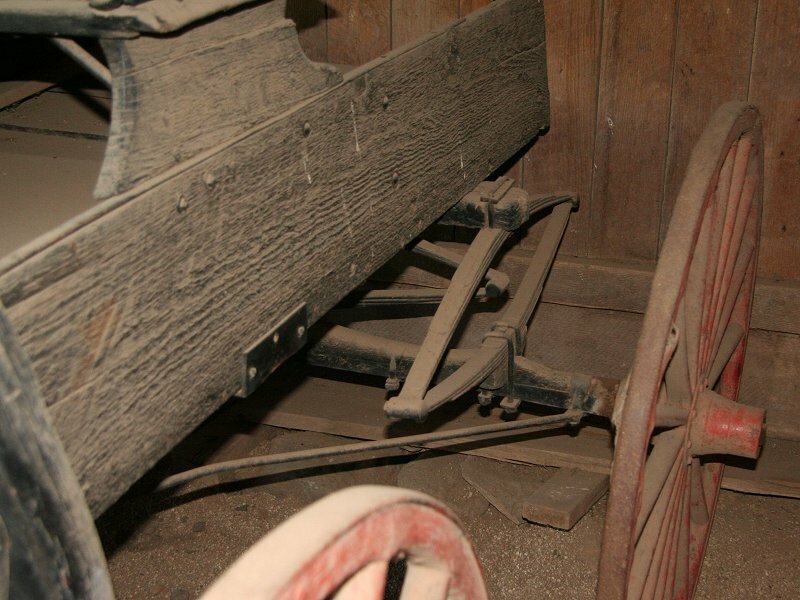 This wagon has four leaf springs: front, rear and one on either side tied to the rear axle. These fairly light springs, plus a horse-hair stuffed leather cushion(missing), made for a comfortable ride. Observe that, unlike the utility wagons (delivery, farm, freight), there are no brakes. The horse provided the force to stop as well as go. A single horse was hitched between the side rails ("shafts"). These attach directly to the front axle, as in the road cart. Closer view of rear spring and a side spring. Tie rods from beneath the carriage to the axle held the axle perpendicular to the carriage. A democrat buggy in service. Those large wheels come in handy for crossing rivers.